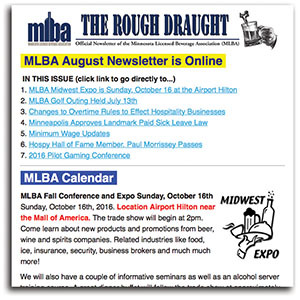 The monthly MLBA Membership Newsletter “The Rough Draught” is now being emailed directly to MLBA Members. You will also receive occasional local information like the RAVE Program from the state and local labor issues like Paid Sick & Safe Leave and $15 Minimum Wage, etc. We will not give out or sell your email address to anyone. Click here to view a past Online Newsletter.